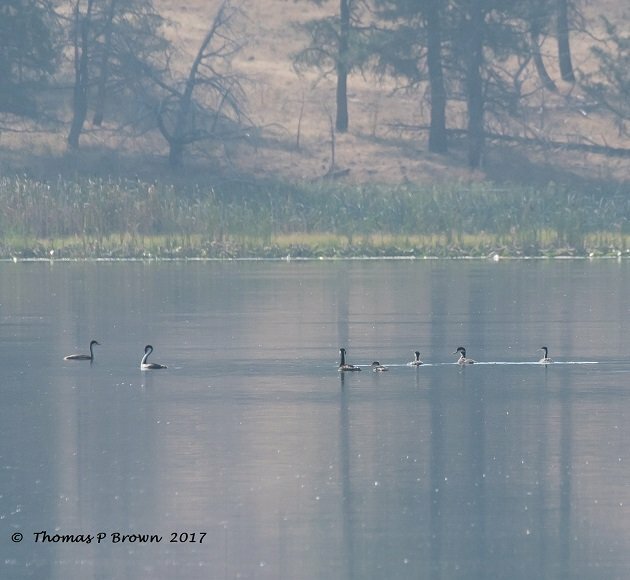 On the final leg of my “Old Home Week”, I travel out to Dog Lake, a pristine high mountain lake, surrounded by mature Ponderosa Pines. Located about 20 miles from Lakeview, Oregon, and sitting at an elevation of 5100 feet, this 208 acre lake is home to many species of fish, including Largemouth Bass, Crappie and Bluegill. With shore side access limited to the northern end of the lake, that protection allows for a large population of water based birds. Back in the late 1970’s, I was stationed there, working for the U.S. Forest Service, on a forest fire crew. There was a small house at the north end of the lake that kept a bit of fishing gear, rented some small boats and had a few snacks. Now, over 40 years later, the Forest Service outstation is gone, the little house has been dismantled, and the boat dock removed. There are still nearly 30 well maintained campsites, but overall the feel is quite different, more remote. My trip out to the lake started well before sunrise, in an effort to be across the valley and headed up into the trees at first light. The sudden need for a cup of coffee and a fresh blueberry muffin slowed me down a bit, but I felt much better for the delay. 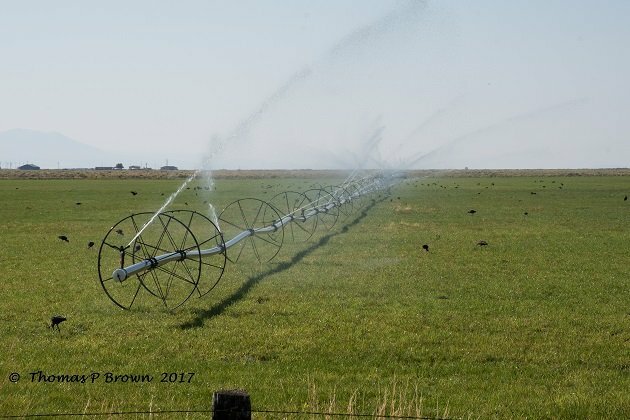 As I passed thru several miles of small ranches and irrigated farmland, I got as bit of a shock, as there were White-faced Ibis all over the place. This is a bird that I have no memory of when I was a kid growing up here. 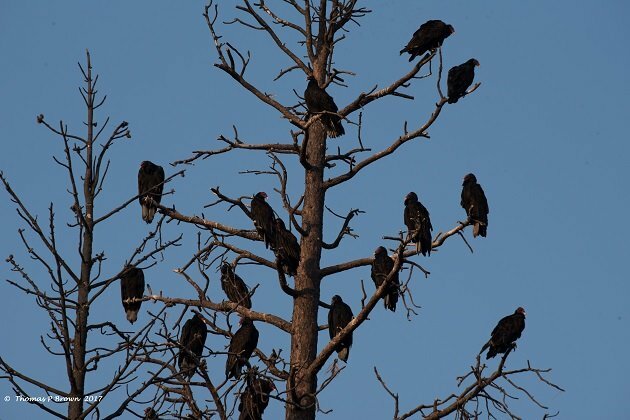 In a 3 mile stretch of grassland, with sprinklers flowing, I counted well over 100 of these dark birds. It was also quite obvious that the raptor migration was drawing close, as the Red-tailed Hawk density was about 5 birds perched on the roadside power poles per mile. 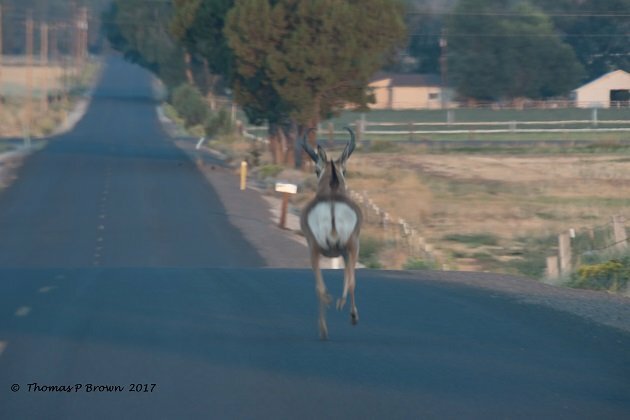 Mule Deer have always been pretty common in this area, but I got quite a surprise when I cleared a small hill in the road, and nearly ran over a male Pronghorn Antelope, right in the middle of the road. 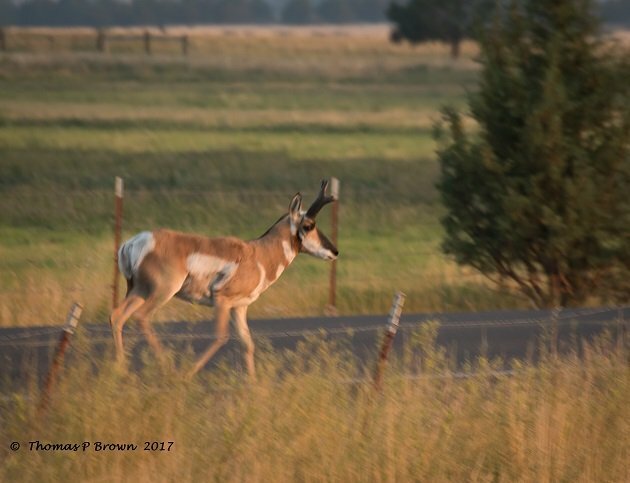 They don’t jump fences like deer do, usually finding a break, or low spot in the ground to dash under the fence material. This young fellow had a hard time finding a place to get off the road, so we slowly made our way thru the country side. Him running ahead, and looking for a spot to get back out in the fields, and me, patiently creeping along. Finally we came to a cross road, where I went straight, and he turned right. I am so out of here…. Arriving at Dog Lake, is another one of those incredible moments when hundreds of amazing memories come crashing back. I stopped my poor little rental car, and climbed out at the first pull-out/observation point, and just listened. Sandhill Cranes calling somewhere on the south end of the lake, Western Grebes calling to one another, Canada Geese honking away noisily, and somewhere above me, Red-wing Blackbirds roosting in a pine tree called out, in their harsh gargling cry. It was good to be back! 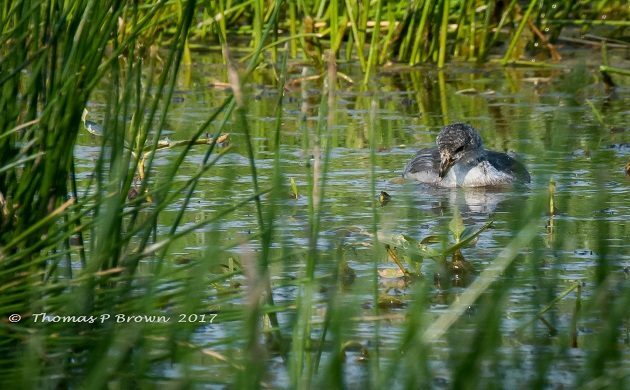 This is one of several families of Western Grebes stayed out in the middle of the lake all day. I spent most of the morning slowly exploring as much of the shore areas as I could get to, and had a few surprises in store for me. 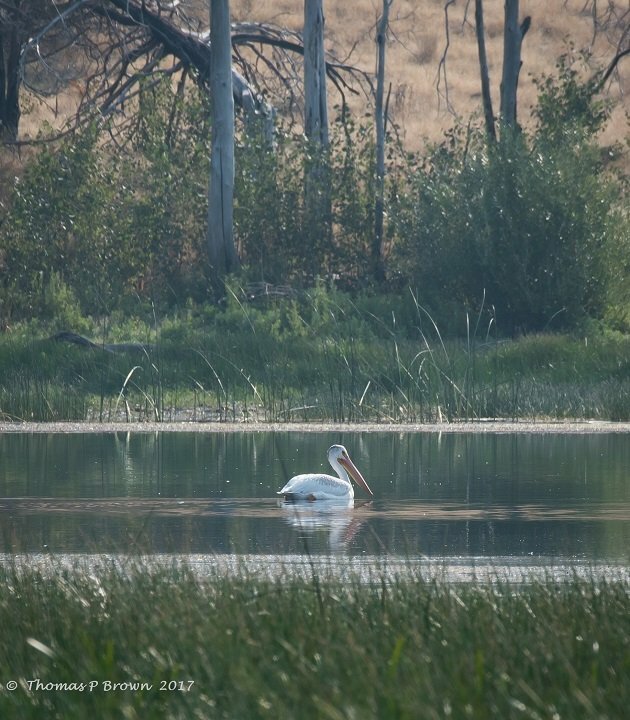 The first was the presence of 10-12 American White Pelicans. I know I am getting older, and my memory is a bit diminished, but this is another bird I have don’t remember seeing here before. Up here on the lake I found more of the White-faced Ibis, along with Pied-billed, Eared, and Western Grebes along the waters edge. 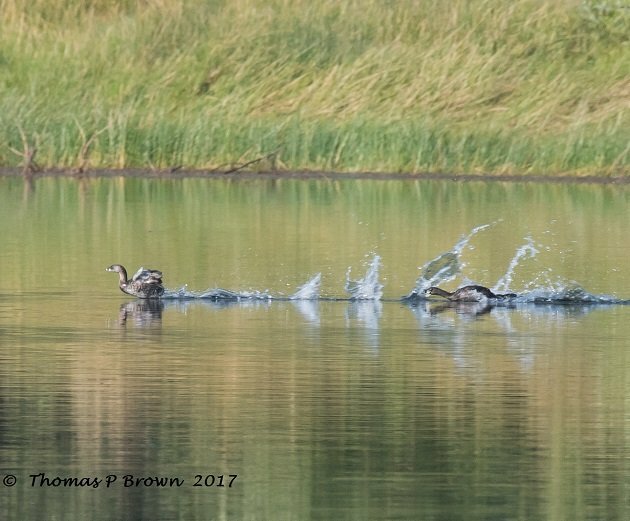 These two Pied-billed Grebes must have spent an hour chasing each other around the lake. 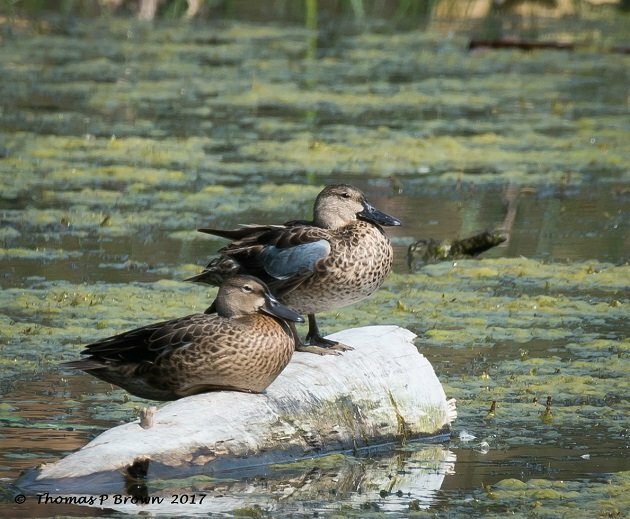 Mallards, Northern Pintails, Northern Shovelers, and Cinnamon Teal were found at nearly ever shallow, weedy spot on the lake. Just above the one of the western most campgrounds, was more evidence that the migration was looming. 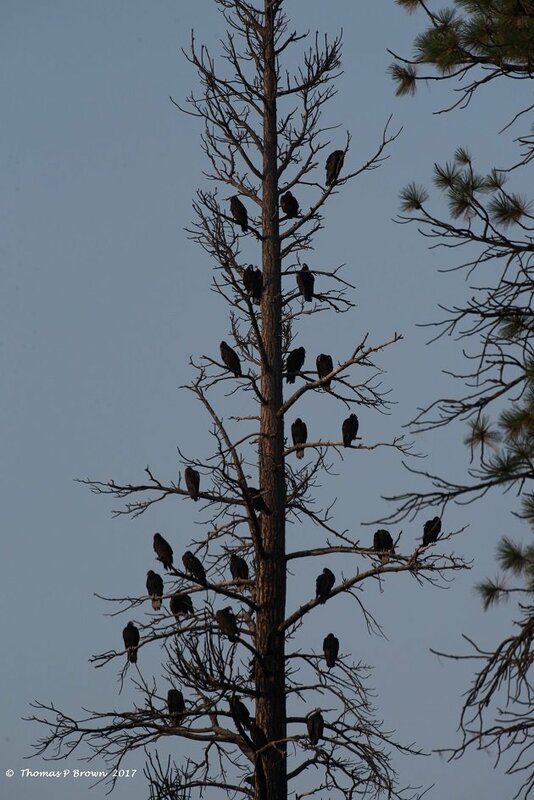 A couple of old Ponderosa Pines, killed in a recent fire, served as a gathering spot for nearly 100 Turkey Vultures. I am pretty sure that they were staging here for their trip south. 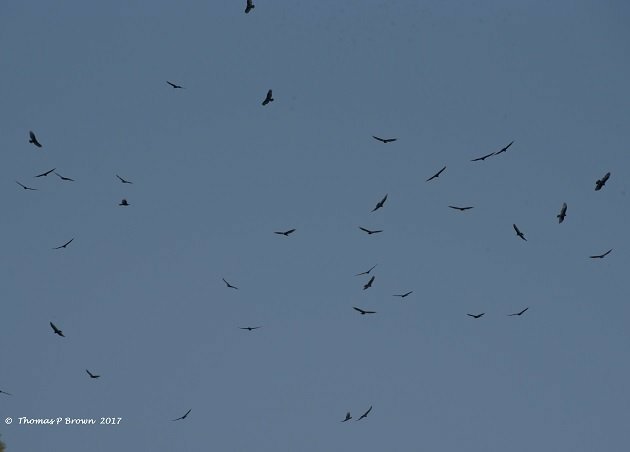 At about 10:00 AM they all took flight and soared above the lake. 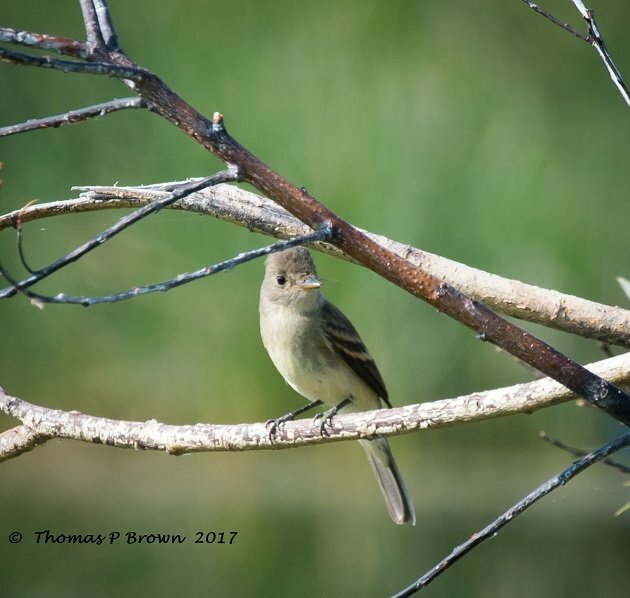 Close to the boat ramp, near the willows and cattails, I found a Willow Flycatcher picking off bugs. 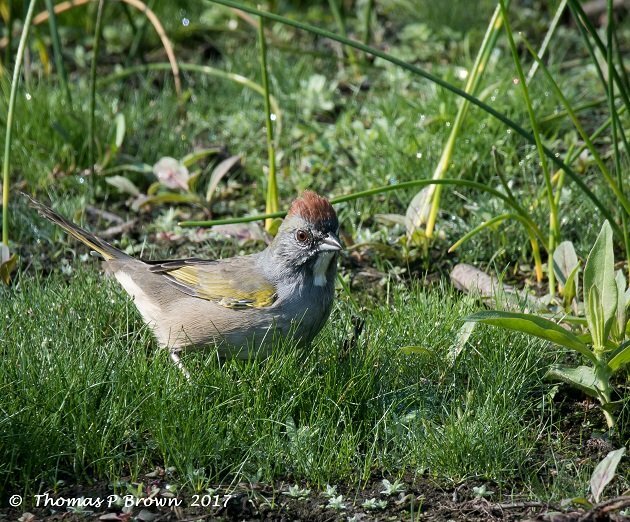 And, down at the base of those same willows, I found a Green-tailed Towhee foraging for a meal. I will be heading back to Mexico now, but will get to travel over to Guadalajara next weekend! Lets see what fun species I can find over there? isn’t it fascinating how the places of our past change? And don’t change. What a pristine, wonderful place Dog Lake is. 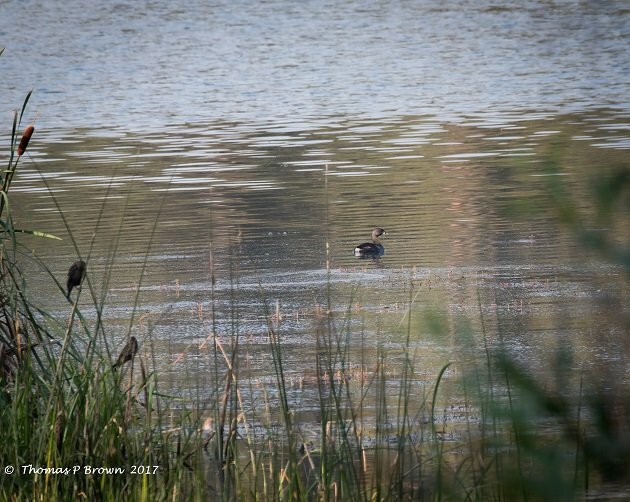 And, why do those Western Grebes ALWAYS hang out far away in the middle of the lake?